Six down, One more to go! The challenge – All those stairs leading up to church! 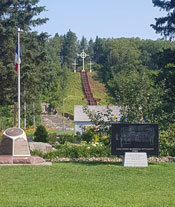 Our First full day in all those stairs leading up to church we got an early start and headed towards Edmundston. It is nice to be back on the four lane highway as there is ample room for the motorhome and me to walk, short of it being louder, it is great. 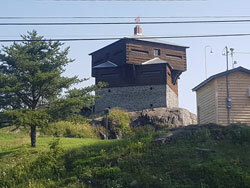 Edmundston was a beautiful little city with loads of history and military strong holds and from what I have gathered, this area was a point of protection on the river back many years ago. There was a beautiful church by the arena in town that had some crosses up on the hill with stairs leading all the way up (135 stairs to be exact). I bet Mom and Kristie that they couldn’t climb them twice, and if they did, they wouldn’t have to walk anymore for two days. I said it jokingly but they took it seriously and both them and the kids climbed up the stairs (only once) which shocked me but also made me happy that they experienced that. Our third day in New Brunswick we were given an awesome show. We finished up for the day and were fueling up in Florenceville and getting dinner when an incredible storm started to form, the clouds were amazing! It looked like two sets of dark clouds moving together with one set higher than the other. The lightning started and the thunder boomed. We sat and watched for a while then drove to our campsite through some of the storm, the rain and wind was incredible. Some times I think we forget what an awesome power mother nature has. Since it was pouring rain we decided it was a good night for a movie so we showed the kids the classic ‘Mr. Bean’ movie which they thought was quite funny, Watching their reactions to the movie was priceless! Mom had some other relatives that had passed away and the funerals were coming up on the weekend. Since we were so close and uncle Jimmie trucks right past us on this highway regularly I suggested that she take the weekend and go visit and see some family that she hasn’t seen in many years. She was hesitant at first but then she decided to go, which I was happy about for her. She had a great time and caught us again the following Monday. The fog is sure thick some mornings now that we are getting closer to the water and it takes a little while for the sun to heat up and burn it off. Makes for walking along the side of a two lane highway a little interesting as well when I can walk fast enough so that the girls in the motorhome lose sight of me, but keeping the motorhome closer during those times works well for visibility and so far we have been accident free! There are more hills in New Brunswick then I had anticipated, nothing extreme but they were a climb just the same. The country side and scenery around NB was absolutely beautiful and reminds me of back home. 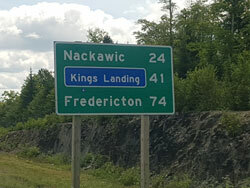 Fredericton is just around the corner. Trying to get contact out to media and keep thing running with work as well as getting things ready when I get back has let a few mornings turn out a later start, which at the beginning I would have hated and been mad about. However since we are a little ahead of schedule and needing to get the word out and reach out to as many media contacts as we can for this last push, I was okay with the slightly shorter days. Walking through Fredericton was beautiful, we walked right past the University. There were beautiful trails all the way through Fredericton that we took advantage of, lined with Maple trees and beautiful flowers. 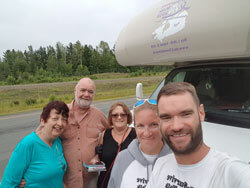 This also marked our 12 days left on this trip and we discussed what it was like on day 12 starting out which wound up being Mother’s day weekend when we were going past Edmonton and took a shorter day in Vegerville. 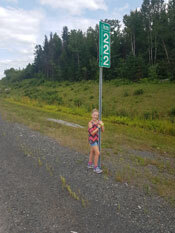 Was hard to fathom at that time that we would ever have 12 days left on our walk across Canada, it was an interesting conversation between Kristie, the kids and I. Longest covered bridge in the World. The time is getting shorter day by day and now that we only have a few days left on the ‘Main’ land version of our trip it is starting to feel real and what we have accomplished as a family. Trying to prep for the next portion of the trip and sweet talking my way on to the Confederation Bridge is my next challenge! Conversations with the bridge patrol superior still got me the same response that I didn’t want “Sorry sir but that won’t happen” I can see the point that it would be a liability hazard having us moving slowly on the bridge. I tried everything to have a few minutes on the bridge but it all came back to “No”. So doing what I always do and most times beg for forgiveness rather than ask for permission. I was waiting to get closer to make a decision but why not go either early in the morning or late at night when there isn’t much traffic, just so that we can get some time and footage of me on the bridge. The days started into the single digits and then the count down was on! Mom saw what was going on and started into a laughing fit which really slowed her reaction time down, so it was a few seconds before she shut the valve. All the while I was watching this episode out the side mirror and laughing to myself! After the maintenance man came over to unplug the line, every thing worked as expected. But that was a story and the chuckle for the next couple of days. Had some great pick up by Global TV in Moncton on the way through – see the article here. Kristie and I have spent a few minutes on the road walking together which has been nice as we have the chance to have a conversation about things and spend time together alone, we are both looking forward to getting back to date night every week when we get home. We had time to stop and see the Giant Lobster in Shediac and take pictures with the kids in the claws. Then as we were leaving heading to the campground we noticed another cousin came to visit. So great to see so much family that we don’t see often because we are out west. The generosity of all the great folks in New Brunswick with all of the honks, waves and roadside donations has been absolutely great! Had a nice young gentleman stop and give us a $50 donation as the camera was rolling from global, he had biked across Canada in 2007 raising money for Cancer as well. Starting to get the smell of salt in the air, we are getting closer to the ocean with every step! Meeting up with family along the way has been fun! We had a slight break down that we noticed when we turned the last corner at Port Elgin towards the bridge. I pulled into the gas station for fuel and got myself all screwed up and couldn’t get out, so we had to unload the car, which was a good thing. We had a busted tie-down strap and somehow we lost the pin that held the tilt deck down, good thing there was a secondary safety. Decided to send Mom back to try and find one in Shediac. I told her how long we needed but forgot to mention the pin size. She was successful finding a pin but it was too big for the hole. Mom thought we could just tap it in with a hammer, but that wasn’t going to work! Since it was later Saturday most shops were closed, so I decided to take a trip to a Canadian Tire to find what we needed, but was unsuccessful. 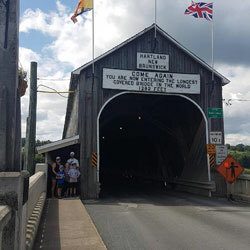 Most times it wouldn’t be a big issue, however on this end of Canada most places are closed on Sundays which means that we have to drive the car for another day or two as we will be crossing the bridge TOMORROW! On my way home I took a drive to the bridge to see what we had to deal with. 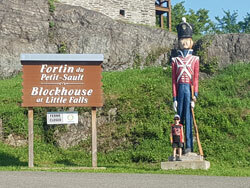 It was on the drive up looking at the bridge that it really hit me…we just walked across 6 provinces as a family! Seeing that bridge hit me with a pile of emotions, excitement and joy. After sitting there and taking it all in, I headed back to the campground and my crew. To support the Can-Survive Walk, visit our Donations page. Donations both big and small will go towards the L Foundation’s endowment fund. Thanks in advance for your support! To date, over $36,550 has been raised to eradicate this dreadful illness. According to the Canadian Cancer Society, over 80,000 people in Canada died from the disease in 2017.